Built for performance, the ImageCLASS MF6530 is a powerful duplex copier designed to produce high-quality laser output. 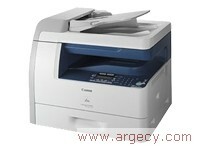 The ImageCLASS MF6530 copies and prints at up to 23 pages-per-minute for high-quality letter-size documents. A large supply of paper can conveniently be utilized from either the 500-sheet front-loading paper cassette or the 100-sheet multipurpose tray. The multipurpose tray can accommodate a variety of sizes and types of paper stock such as bond, plain and color paper, transparencies, labels and envelopes for special projects.